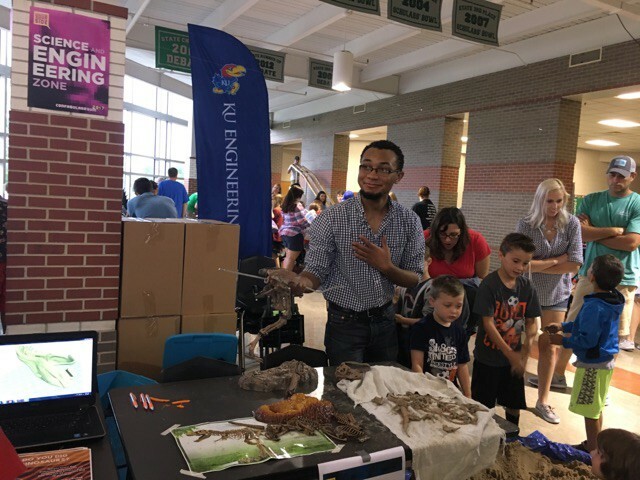 On August 5th, the Kansas Enrichment Network (Network) attended Lawrence’s annual Festival of Making and Creativity, the ConfabuLarryum at Free State High School. The free event brings together people from all ages and backgrounds to ignite their senses of wonder and curiosity. Parents, educators, and business professionals all came out on a stormy Saturday morning with their kids, ready to explore the infinite possibilities of making(1) when paired with unbound creativity. In the four years since its inception, ConfabuLarryum attendance has grown rapidly, from around 500 the first year to roughly 9,000 participants at this year’s event. From beginning to end, the school was buzzing with curious and eager youth and their curious, yet cautious parents. Supplying all the excitement were “Creatives” like FIRST Robotics, Science City,KU HawkWorks, and Pet World who played to their strengths, showcasing how creativity, imagination, and first-hand exploration are important in everything they do. Science City and Pet World were big attractions with Science City hosting a pinewood car derby named “The Nerdy Derby,” while Pet World fashioned a petting zoo featuring rabbits, turtles, and other small animals. It’s amazing to think just how many youth and adults might have found or rediscovered their sparks(2) that day. As one of almost 50 Creatives, the Network capitalized on that youthful urge to uncover lost treasures (and also get dirty) with Dino Dig! The activity consisted of a kiddie pool filled with 150 pounds of sand and two disassembled model dinosaur skeletons. We buried over 40 pieces of a 36-inch Tyrannosaurus Rex throughout the “dig site” and asked youth to help us uncover the pieces and think about how they might fit together. Kids aged 18 months to 12 years worked to dig up the bones, and once all the pieces were found, they helped us bury them again for the next group of junior paleontologists. The excitement in each “I found one!” and “I’m good at this!” made parents just beam… right up until the moment they realized how much sand was still stuck to their child’s hands. But the kids’ smiles never faded. For older kids who weren’t as eager to get their hands dirty, we provided a smaller, 24-piece Velociraptor skeleton that takes around 10 minutes to assemble, as opposed to the T-Rex skeleton, which due to so many indistinguishable pieces, takes an estimated lifetime. Along with Dino Dig! 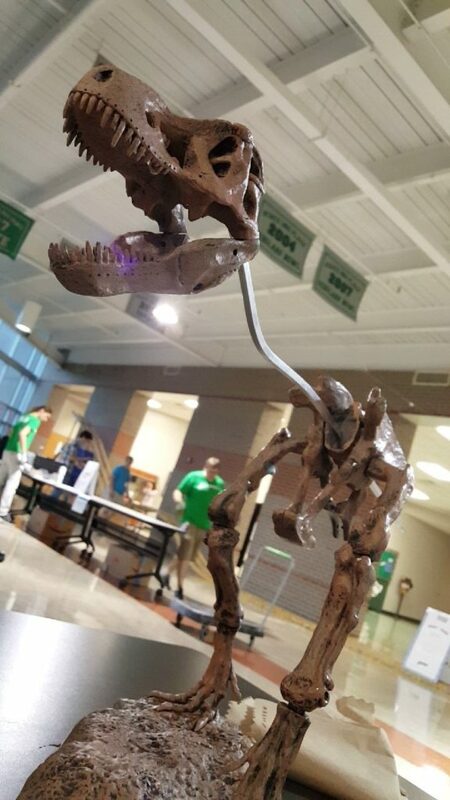 the Network showcased its Lulzbot Mini 3D Printer to demonstrate how an educator or parent might use the printer to create their own dinosaur bones — a much cheaper alternative to buying professionally-made kits. As their children and youth were digging up or piecing together the dinosaurs, several educators and parents came with questions about the printer, curious how it worked and brainstorming different ways they could incorporate it into their personal and professional lives. ConfabuLarryum was a great opportunity for us to promote the applications from teaching youth to code to creating materials that fit their program needs. With 3D printers becoming more common in out-of-school time (OST) programs, the Network is very fortunate to have one in-house. Gaining first-hand experience with the latest in education technology is essential for the Network to continue providing the high-quality technical assistance that our programs have come to expect, especially in the areas of science, technology, engineering, and math (STEM). As we move toward an increasingly digital society, STEM skills are becoming more important in the workforce. But more than that, informal STEM learning has been shown to benefit all youth, not just those who end up pursuing STEM careers. The Network mission leads us to seek out and support events and programs exactly like ConfabuLarryum. In sparking youth exploration and self-discovery in ways that propel youth into hope-filled futures, these events and programs are helping youth prepare for life in ways they may never fully realize. I left ConfabuLarryum inspired and invigorated in ways that I hadn’t expected. Events like these remind me that when organizations work together to invest in their communities, the positive impacts on families and youth reach far beyond city limits. For more information on the ConfabuLarryum, visit their websiteor Facebook. (1) Making in this context refers to the collaborative, project-based exploration that happens within a makerspace — a space designed specifically for people to explore science, technology, engineering, arts, and math or “STEAM” concepts. (2) A spark is a skill, interest, or traits that we are passionate about and that motivate us to action. Hear more about sparks!